I wasn’t sure if this deserved it’s own post, but the more I thought about it I think it is important, because it speaks to the Simon team’s attention to detail. Below is actual video of the first second line after the Flood, January 15, 2006. There is one tiny detail buried in this shaky video that shows up in the Treme version as well. Hell, I didn’t even notice that detail on Treme until the second watch, so we are talking small details. Second line maven Lisa Palumbo got it right away when I put this up on Facebook as a challenge, but I’ll leave the rest of you to figure it out. It’s only there for a fraction of a second while the camera cuts and swings so you better be watching close. I’ll post the answer in a day or so because I want everyone who says “this or that isn’t authentic” to remember just how committed to authenticity Simon is, and he’ll only move off that dime for the story. It is an amazing detail because if I give you the time cue it’s so fast you’ll probably miss it the first time because you’re watching the clock, but someone on the Simon team got it. Hmmm. That was my guess too. You’re both almost right. There’s only one I saw in the original video. You talking about the street signs? The only one I remember seeing in the show was Pleasure. This is going to make me crazy. I think I may know, although I’d have to watch Treme again. Are we saying? huh…that was going to be my guess too….curious to see the correct answer! You’re all almost right. It was specifically the Pleasure Street sign that appears very briefly at 2:17. I didn’t see any others in the original. I’ll have to upload my video at some point. The thing, though is that it turns out this wasn’t even the “first second line after the storm” I thought it was the other day but when I went back through the Yellow archives I found this from December 2005. The pictures in that post are screwed up for some mystical cell phone related reason but they render properly if you click on them. Can some one clear something up for me? I thought the first second line was the one where people had the ReNew Orleans shirts on and it ended in a shooting. I remember being so joyful at the return of a piece of New Orleans culture and then heart broken again hearing it ended with the curse of the city that was before Katrina. When was that second line? Ok, I thought the sign they had in the first episode was Desire, not Pleasure. You’re thinking of the All Star second line parade on Jan 15 2006 which is the same one we have here in the video and in the Flickr photos I just linked to. NOPD Superintendent Warren Riley increased the fees shortly after the All-Star Second Line Parade, hosted by the task force and 32 social aid and pleasure clubs. Hundreds of social aid and pleasure club members and three brass bands returned home for the January 15 parade, which wound through traditionally black downtown neighborhoods. (One Uptown NOPD captain refused to let the parade pass through his district and so the parade had to scrap plans to also march through Uptown.) Club members wearing ReNew Orleans t-shirts dedicated the parade to returning residents’ needs, including housing, jobs, and health insurance. After the parade was over, club members socializing in front of the Zulu Club on Broad Street and Orleans Avenue got word that a shooting nearby had wounded three people. Bystanders say that the shooting was prompted by a pre-Katrina grudge about a jacket. And yet, as I’ve been saying, there was a parade Uptown in December that seems to have fallen through the memory hole. Pleasure Street sign. I noticed it the second time through watching Treme and I’d seen this video. I was thinking some poor prop guy was sent out to find that sign, or make one. That’s gotta be it. And hell yeah, THAT is detail. Sam: I was thinking they had to have made that sign. And still think it was Desire in the show and not Pleasure. Around October 15th 2005, I remember a jazz funeral for Katrina & Rita with a second line, but that was through the Quarter and with very few musicians. Not a real SA&PC second line through the back of town with 500+ people. Only remember because NPR (the N stands for Nattering) covered it with fotos. Thank you Jeffrey! I was beginning to doubt my memory. It was a very important moment to me even though I have never been to a second line. I just wanted my New Orleans back, and this was an important step towards that. Again, thank you for putting my doubts to rest. the intersection of pleasure, and new orleans is by my house. i think that’s why i noticed it on the first viewing. No, on my third watch through I jotted down a note for Pleasure Street, as it seemed perfect. And then I said the video going through Red Cotton’s stuff. 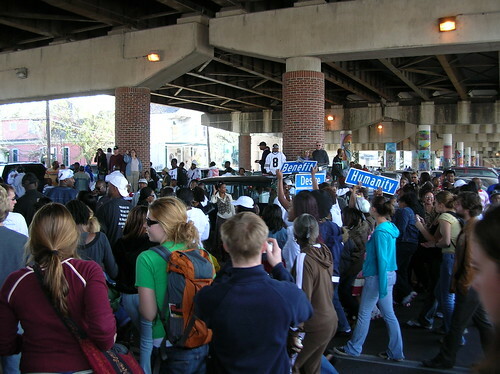 We participated in a wonderful second line in the Treme that started and ended at Backstreet on November 1, 2005. The route took us alongside Armstrong Park, onto Rampart and a block deep into the Quarter. Leroy Jones and the band were dressed to the nines, too. It was the most soul stirring second line I ever attended. It went into the evening and I took a few pictures that are currently posted on my http://stevepicou.com site (Apple orphaned the online .mac web system and I haven’t updated those pages in a long time). It was All Soul’s Day and I’m assuming that was the reason. It wasn’t a very big crowd, probably around 100 or so. Freddie Lonzo, Woody P, Shannon Powell are some of the musicians I recognize. We stopped at Little People’s Place. And Mr. Ramsey had an amazing suit featuring Katrina-related headlines and articles. The first really big second line, Jan 15, was the one depicted in the show. I wish they’d have used more street signs because Humanity and Desire, in particular, stuck out for me. I also have pics of that on my personal site. I am guessing if they has your or Jeffrey’s stills there might have been more signs, but you get the feeling watching both they studied the video closely. Many photographers took photos of the street signs in the All Star second line. I was particularly struck by the sign for Humanity Street. Oh the humanity. And yes, including that does represent an obsessive attention to detail. Good for Simon! http://www.flickr.com/photos/hammhawk/87060141/in/set-72057594048886555/ I noticed that in the show too, and it’s a tribute to the show that they didn’t make a big deal about it. This all star second line was not the first one after Katrina. There were parades in the fall of 2005. In fact, Spike Lee got footage of those parades in his film. Joe Stern, of the Original Prince of Wales, was one of the main organizers of the first parades after the storm.